How many times have you heard the saying,” Abs are made in the kitchen”? I know I have heard it many times and I see it all over Instagram! It is honestly one of the truest sayings out there. No matter how hard you workout in the gym you cannot out-train a bad diet. It catches up to you eventually. Lean protein helps repair muscle tissue and aids in muscle growth. It also helps with the development of skin, hair, and nails. healthy carbohydrate: sweet potato, brown rice, quinoa,couscous, vegetables,etc. Carbs are your body’s energy source; think of it as fuel to the fire. One of the most common misconceptions is that “carbohydrates make you fat”, this is just simply not an accurate statement! Think about it, too much of any food even healthy can cause weight gain. Carbohydrates can help you lose weight and help promote healthy weight loss. Moderation is key. Vegetables (a complex carb):I choose dark leafy green veggies like spinach, kale, or field greens. I also eat a lot of broccoli, Brussel sprouts, and asparagus. Even though vegetables are technically carbs because they have carbs, they still provide important vitamins and minerals that other carbs like brown rice or sweet potato may not provide. Fat: I choose cooking oils such as olive oil or vegetable oil and I choose foods high in healthy fats like almonds, almond butter, avocados, etc. Despite its name, fats are very important when it comes to a healthy diet. Fats are very important for energy and provide storage spots for your body’s energy. It also helps transport vitamin a, d, e, and k throughout your bloodstream and helps absorb them into your body. The picture above is from my meal prep today 🙂 I cooked quinoa for the first time. It came out bland. I am going to research some recipes to help season it up a bit. If anyone has any recipes you would like to share with me that would be so very helpful! I also chose to cook broccoli because it is one of the easiest veggies to cook and one of my favorites! For my protein source I almost always go with chicken. I add garlic powder, black pepper and this time I added a European Basil blend. It came out absolutely delicious and I did not need to add any salt. 🙂 I like bland/earthy flavors so you can obviously season your chicken with anything you prefer! 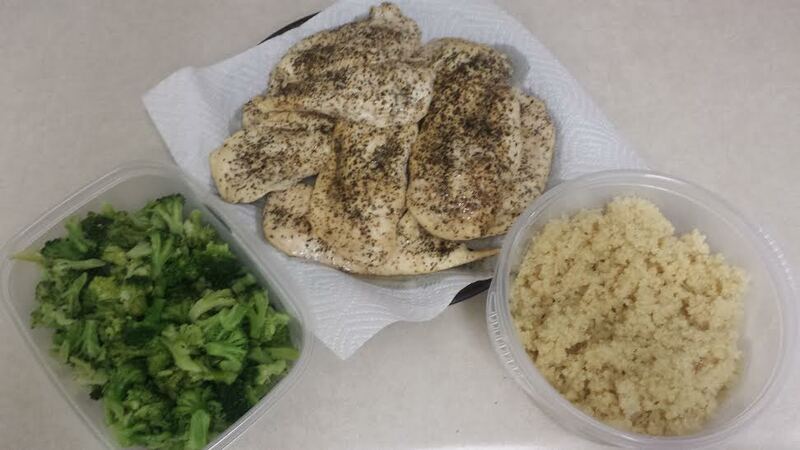 Meal prepping doesn’t only have to be for the person who is a body builder or woman/man who is prepping for a show. Meal prepping can be applied to anyone’s weekly routine! It helps to have that food readily available when you’re tight on time. It is already prepared and cooked, just heat it up and chow down!